Please note that we will look at the formation of some other Pure Land schools and their founders a little later on this site. There is no intent here to consider the Jodo-shinshu school as the "standard" school of Pure Land Buddhism, though it is the most popular form in Japan and the one in which Westerners tend to be most interested.1 I am using Shinran's classification as representative here simply because his way of organizing the historical development that led to Jodo Shinshu provides a nicely delineated pattern. We will need to add some further names to those mentioned here, but here we have a convenient place to start. 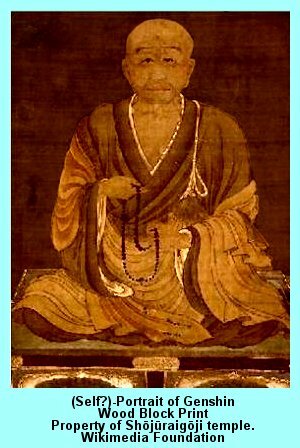 Shinran, the founder of Jodo Shinshu recognized seven "patriarchs" of Pure Land Buddhism. The word "patriarch" in this case has the connotation of "precursor," and thus, for example, the followers of Honen would hardly want their master to be considered as a mere forerunner. So, we need to acknowledge the importance of these "patriarchs," but we also need to realize that this classification is objective only for some adherents of Pure Land Buddhism, specifically Jodo Shinshu. Each of these individuals has a Japanese honorific title in addition to his actual name, even the Japanese ones. We will list those appellations along with their common names, when they lived, and what they contributed to the development of Pure Land Buddhism. This list takes the existence of the three Pure Land sutras for granted. We can only give a rough estimate of when they were written. By the time of Nagarjuna they already were in existence. Consequently, if we suppose a date for Nagarjuna's work around the year AD 200, that would be the latest date by which they would have been written. It is not unreasonable, then, to speculate that they may have originated by AD 100 or earlier. Thus, the ideas of Amitabha's Pure Land have been around for a long time, going back to the early days of Mahayana Buddhism. 1. Nagarjuna (Ryuyu, ca. AD 150-250). Nagarjuna is, of course, best known for founding the Madyamaka philosophical school, which eventually was incorporated into most of the Mahayana religious schools. He stressed the idea that, even though the entities we perceive around us are real, they have no real essences, and, thus, in the final analysis are a part of the great emptiness, Sunyata. An issue in Buddhist thought has always been, and still is, at what point a person has reached the state of "non-retrogression" (aninivartaniya). In clearer terms, when has a person arrived at a place where he or she is no longer in jeopardy of losing the fruit of their spiritual attainment? In the earliest years of Buddhism, this condition had been thought of as synonymous with reaching nirvana. But the Pure Land sutras seem to have introduced a new dimension, namely Amitabha's realm, which is not synonymous with nirvana, but is free of any impediments to nirvana. Then the possibility of retrogression could be ruled out once one is reborn in the Pure Land, even though one may not yet found nirvana. I must add quickly that for some later important thinkers (e.g, none other than Shinran), the Pure Land is, in fact, identical with nirvana. If that is the case, we certainly have further reason to consider the descriptions of the Pure Land as truly symbolic. However, such an identity is not accepted by many other thinkers, and for them the Pure Land would, indeed, be a place of non-retrogression, but fall short of the ultimate goal of nirvana. In his religious writings, Nagarjuna concerned himself with this very question on the attainment of non-retrogression, but it is not clear whether he thought of the Pure Land and nirvana as identical. In the 9th chapter of a book called Dasabhumika-vighasa sastra, he described two paths of attaining non-retrogression. He called one of them "the difficult path," and compared it to someone trudging along a dirt road and making slow progress. This is the path of the monk who seeks to attain nirvana through strict discipline. The other path is the "easy" one; at its core is the reliance on the vows of Amitabha. Here we may think of a large ship making rapid progress over the water with its sails filled with favorable winds. It is not clear that Nagarjuna advocated the path of easy practice as superior to the difficult one, but he did state that the term "nembutsu," the mantra associated with Amitabha, provides an assured path to Buddhahood. Nonetheless, we tread carefully and avoid reading later developments into Nagarjuna's teaching. For him, the nembutsu is not just a formula to recite but an all-encompassing life of devotion to Amitabha. b. praising Amitabha. There is a difference. Worshiping usually (not just in Buddhism) includes the meaning of bowing down before the supremacy of the deity, person, or object of worship, while praising is a subset of doing so. Still, since it is listed as one of the five points, it is clearly a very important subset. c. wishing to be born in the Pure Land. Obviously, everyone knows that wishes don't necessarily come true. The point is that rebirth in the Pure Land does not occur against one's will or without one's consent. One should clearly be determined to be born there. d. contemplating the Pure Land, Amitabha, and various bodhisattvas. More specifically, such contemplation includes pursuing visualization techniques to see Amitabha in his realm with one's spiritual eye. e. transmitting merit to other beings. In the development of Mahayana Buddhism benevolence became an important virtue. 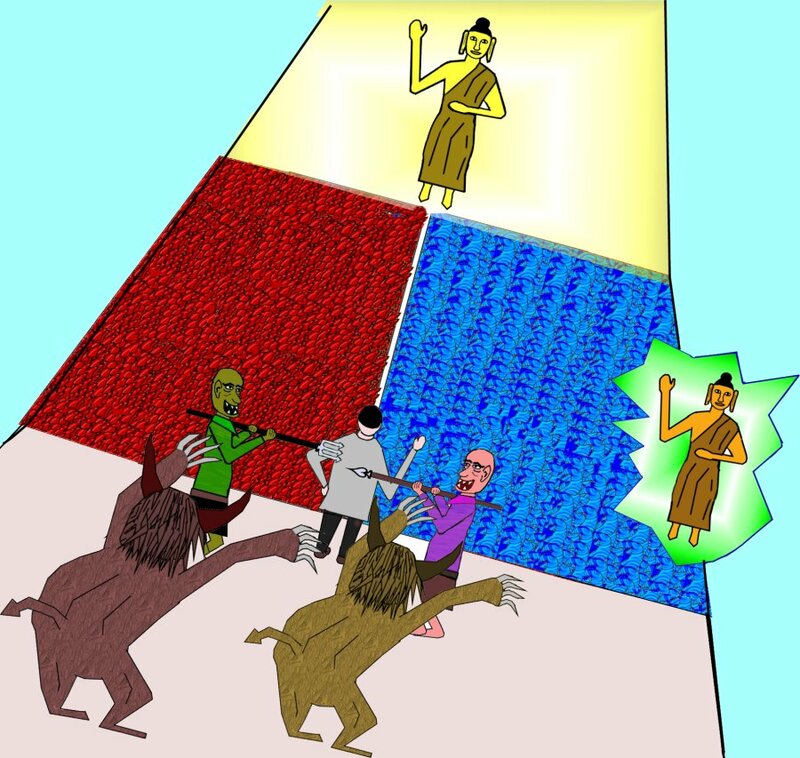 In the Pure Land story, we see Dharmakara seeking to become a Buddha and creating the Pure Land out of compassion for the suffering beings in the world. Thus, someone who wishes to take up residence in Amitabha's Paradise should also be a person who has cultivated compassion. The last point contains a highly important consideration. In Vasubandhu's thought, once someone has reached Buddhahood, he must not dissolve into nirvana, as it were, but is obligated to return to the world of suffering in order to show others the way to the Pure Land as well, viz. to become a new Tathagata. As in the case of Nagajuna, it is not clear that Vasubandhu considered the "easy" alternative to be the preferable one. 3. Tanluan (Donran, AD 476-542). There is no such ambiguity in the thought of Tanluan, the first of three Chinese Pure Land patriarchs in Shinran's assessment. His early studies were in philosophical Daoism, but after some personal struggles, including health issues, he turned to Buddhism. There are several conflicting stories concerning his conversion, but there is no question that he elevated the prior Pure Land teachings to new heights in importance and scope of reflection. Tanluan made the distinction between "self-power" and "other-power" (Japanese: jiriki and tariki, Chinese: zu-li and to-li respectively). Self-power is the reliance on one's own ability to attain nirvana. Most forms of Buddhism, even if they lay some claim to other-power, are built on a framework of self-power. It is up to the individual practitioners to work through the way to enlightenment; even if they should receive some help, they are still responsible for whether they make progress or not. A sidelight: I once heard a monk in a Theravada setting make a speech in which he appealed to Christians by asking the rhetorical question: "Doesn't even Jesus say in the Bible that 'God helps those who help themselves'?" -- Well, no. That is not a biblical exhortation. Nonetheless, it illustrates the importance of self-power in his own tradition. Tanluan was a strong advocate of the need for other-power. He wrote a commentary on Vasubandhu's treatise on the Longer Pure Land Sutra, in which he declared that the time for relying on self-power, let alone on nothing but self-power was past. He may have been the first writer to give precedence to the so-called easy way of other-power over relying on self-power. He considered enlightenment by means of self-power to be virtually impossible. His concept of other-power was multifaceted. It included the power of Amitabha, but also Amitabha himself as well as his vows. He further made the distinction that what is other-power to us is, in one sense, self-power for Amitabha. Therefore, the concept of other-power, when applied to Amitabha is an extension of himself to us, whereas for us, other-power is the reception of Amitabha, as expressed in the nembutsu. We need to understand, though, that Tanluan's emphasis on other-power was far from Shinran's later doctrine of reliance on Amitabha alone as the key to rebirth in the Pure Land. For Tanluan, as for every one up to Shinran, faith in Amitabha and his vows was under-girding a life of acts of devotion, and these actions were also important. 4. Daochuo (Doshaku, AD 562-645). Daochuo expanded on the distinctions brought up by Tanluan. He also stressed the distinction between self-power and other-power. He took an even stronger view of the need for other-power. Whereas for Tanluan it may have been the better option, in Daochuo's writings it became the only option. Daochuo intoned a theme that would become louder and increasingly prominent among Pure Land thinkers: We live in an age that has become so dominated by hindrances, that it is impossible to find release from it except by Amitabha. 5. Shandao (Zendo, AD 613-681). As is true for all of the subsequent figures in the formation of Pure Land Buddhism, Shandao's early scholarship took place in the Tientai (Tendai) context. It is likely that he Daochuo became his master and immersed him in the beliefs concerning the Pure Land. Remember that there still was no separate Pure Land school, but that the notion of a Pure Land was an important aspect of Mahayana Buddhism in China. He lived in the earlier years of the Tang dynasty, when Buddhism received imperial support in China, and--as a consequence--was making a large impact on Chinese culture. Shandao focused on the nature of the human mind. The goal of Pure Land Buddhism is shinjin--a true and pure mind. To arrive at that point one needs to cultivate the right kind of deep mind. There are two forms of "deep mind," according to Shandao. When common beings plunge into the depths of their mind, they will discover a world of despair: We are entrapped in a world of illusion, unable to see things clearly, and, therefore, unable to rescue ourselves. It is the deep mind of the dharma (as represented by the vows of Amitabha) that we learn of Amitabha's compassion, which will bring us hope. Shandao illustrated his teaching with an allegory, which I will try to retell in my own words.2 The story begins with a man undertaking a lengthy journey to the west on foot. As he was hiking along, he noticed that the surrounding vegetation was getting sparser and sparser by the day until he found himself all alone through a barren wilderness. But was he truly alone? No, he was not. He became aware that there were other people on his trail, and he realized that they were evil men who would probably kill him and take his belongings. Not only that, there were dangerous monsters present as well, not too far from him. He sped up his pace, but so did his pursuers. His fast walk turned into a run, and still he was not increasing the distance between himself and these other beings. The situation became quite unnerving. And then he hit an obstacle of gigantic proportions. The layout is a little bit difficult to visualize. There were two extremely deep rivers, blocking his path, one extending a seemingly never-ending distance to the south, the other one flowing just as far to the north. The southern river was a river of fire with large flames that could turn someone into ashes in a brief moment. The northern river consisted of water, but the water came in huge uncontrolled waves that could grab a-hold of a person and drown him instantly. These rivers were separated by the tiniest of paths, nothing more than what appeared to be a narrow white line, no wider than a hand's breadth. For the traveler, the situation appeared to come down to the simple choice of which way he might prefer to die: by being killed by the robbers and monsters on his trail, by being burned in the river of fire, or by being drowned in the river of water. Trying to walk either north or south would be useless, and he would be easy prey to the malicious creatures. The narrow white path did not seem to hold any promise of safety. Nevertheless, since it was the only conceivable way of escape, no matter how slim the chances, he resolved to take one hesitant step forward. No sooner had he done so when he heard a voice from somewhere in his surroundings on the eastern shore of the two-river obstacle where he was standing. "Go ahead. If you stay where you are you will most certainly die. This path is your only way of escape." He took another step. In the meantime, the miscreants had arrived at the shore, but fortunately by now he was just barely out of their reach. They tried to entice him to turn around and stay with them. "You are only going to kill yourself by trying to walk on that path," they advised him. "It'll be best if you turn around now and join us. We are your friends. We don't mean you any harm; we only want to help you. C'mon back, and let's enjoy each other's company." Or words to that effect. Just then the traveler, who was still a little uncertain what to do, heard a voice from the other side. "Just go ahead. Keep focusing on staying on the path. Trust me, and neither the flames nor the waves can harm you. I will make sure that you get here safely." Now the man abandoned all fear; he kept walking, and once he reached the western shore, he was greeted by the friend who had encouraged him to walk in full trust. Together they celebrated his arrival. Even though this story is usually called a parable, I referred to it as an allegory. A parable usually makes one particular point with a story, and the specifics are not necessarily representative of some further, perhaps abstract, meaning. By contrast, an allegory is a story in which each particular item usually has a direct counterpart in the spiritual realm. That is the case for the story of the White Path. The man was someone who was living in the present world, which is a world of danger and destruction. 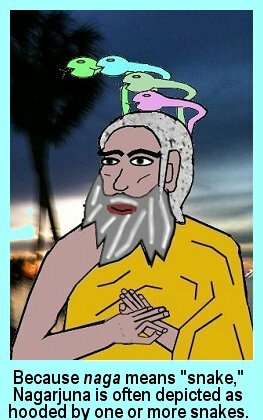 The fact that he was heading west indicates that he was on his way to Amitabha's Paradise, which is located in the western quadrant of the cosmos. The robbers and their enticing cries were the many impediments that came to him via his senses; many people allow themselves to be hindered by them and never complete their journey. The two rivers each have their own meaning. Water stands for greed and human affection, which can easily kill a person's spiritual aspirations. The fire represents the hate and anger that are bound to scorch us when our greed and desires go unfulfilled. The tiny white line is the way to the Pure Land. The voice that the traveler heard on the eastern side of the shore was that of the Buddha Sakyamuni (Gautama of the 6th century BC) who had passed on into nirvana, and, thus, could no longer be actually present, though his voice (i.e. his teaching) was still available. The friend on the western shore was Buddha Amitabha, who had encouraged the man to entrust himself to him so that he would arrive at his goal unharmed. 6. Genshin (Eshin Sozu, AD 942-1017). We need to advance by more than two centuries and cross over onto the Japanese archipelago to encounter the sixth patriarch according to Jodo Shinshu reckoning. He was an adherent of the Tendai school and counts as one of the great Tendai teachers. 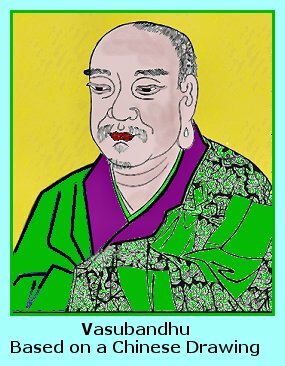 His most famous work is called Ojoyoshu ("Essentials for Attaining Birth in the Pure Land"). As did his predecessors in the Pure Land line of thought, he made a strong distinction between self-power and other-power. He was also convinced that the present age, in which there is no Buddha, is the age of mappo, which means decadence and lawlessness. Mappo also entails that there are far too many hindrances for anyone to attain nirvana by self-power. Anyone attempting to do so will fail and spend time in hell. The only hope for people is Amida Buddha and the Pure Land. In his writings, Genshin provided his own illustrations of those two options, making his message clear and understandable. Genshin recognized two groups of those who rely on Amida: Those who focus on nothing but him and those who blend devotion to Amida with other Buddhist practices. The former group will receive immediate admission to the Pure Land upon death, whereas those who were not exclusively devoted to Amida need to spend time becoming transformed first (called the "embryonic" state by Tanluan). 7. Honen Shonin (Genku, AD 1133-1212). For many Pure Land Buddhists, Honen is the master. Under his guidance, Pure Land separated itself from Tendai as well as those other schools in which Amida and the Pure Land may have played a significant role, but were not the entire focus. He gave Pure Land Buddhism its own identity as a separate school. We'll have lots more to say about him on the next page. 1A summary from a strict Shinran point of view is made available by the Vancouver Buddhist Temple Back to text. 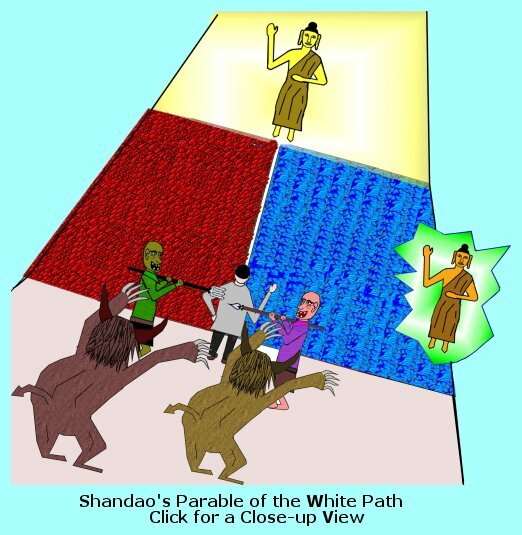 2 For a direct translation of Shandao's text see the web page, The Parable of the White Path. Back to text.